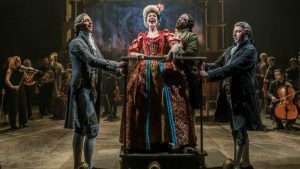 Following a succesful run at The National in 2016, Michael Longhurst‘s production of Peter Schaffer‘s Amadeus returns with a high level of fanfare. Having missed it first time around, I arrive with few expectations, my only familiarity with this play being Milos Foreman‘s 1985 film adaptation. Today, Rufus Norris, Artistic Director of the National Theatre, has announced what is coming up in the new season: Four world premieres, two European premieres and co-productions with Headlong, Fuel, West Yorkshire Playhouse, Out of Joint, and Improbable, featuring new work by Inua Ellams, Yaёl Farber, DC Moore, Lindsey Ferrentino and Nina Raine.